Imagine sitting in class, surrounded with like-minded people and learning from one of the most documented network marketers EVERY week...learning not only what tactics he used to build his business to over 750,000 satisfied customers, but also the structure you can utilize to build your own business. That is what Tribe is all about. I just signed up for the Tribe Course. Will I be able to watch the previous classes? Hello Dana, yes! 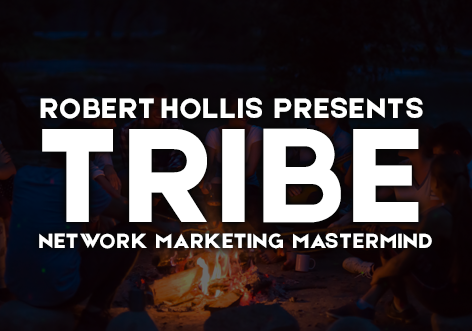 You will have access to all of the past replays for Tribe once you are a member of Tribe or Inner Circle. If the replays are not available, please contact support by email support@roberthollis.com or clicking on the “Help” button at the bottom right of your screen. Hi Robert and Matthew. I watched the #3 video this morning. Mind Blowing!! I was not able to see the links to use on FB Messenger when people inquire. I got the “send a video” message, just not sure where to find the links. Thank you for all the great information. I can’t wait to get started. I really enjoyed Matthew’s perspective . And what wisdom for a 27 yr. old! I can feel your pride Robert! I am soooo looking forward to 2019! this is going to be an amazing tribe! How do I get on the live Tribe call (Council?) on Saturday morning? You will receive an email Saturday morning with a unique link to join the show live. I love ❤️ our TRIBE!! Feels great to be building friendships with like minded people, and to have such an amazing friendtor!! Is there an app I can put on my phone for the tribe group ? Where is the easiest way to watch the Saturday morning trainings by Robert Hollis ? Everything on RobertHollis.com is mobile friendly and all of the training, courses & videos can be viewed from a mobile phone or tablet. We will look in the future on adding a complete app for these features on the Apple App Store & The Andriod Store.